Laura Waldo-Semken was born in 1969, in Kansas City, Missouri. Her parents divorced when she was two. She grew up mostly in Kansas City, Kansas, with her two older brothers; one of her brothers died in 1980 at age 18. She also has a stepsister and stepbrother from her father's remarriage. She received her B.F.A. in Printmaking from the University of Kansas in Lawrence in 1991. She is married, and at the time of the interview, worked part-time for the Episcopal chaplain at the University of Iowa and ran a caf� for homeless people one day a week. She works with wood, paint, collage, and found objects. "In the last seven years, I have not been quite as active as an artist. My daughter, Fenna, was born in 2000. I began playing my viola again and now play in a trio and the community orchestra. I quit doing art fairs when my daughter was born and have not found the drive to return to the fair scene. Instead I spend my summers as a camp coordinator at University of Iowa School of the Wild at the Macbride Field Campus. I am hopefully passing on my love for the woods, prairie, birds, and conservation education. I am working more two-dimensionally with fabric. I am definitely still using aspects of sacred geometry and numerology. I still like what my artist statement has to say. I like fabric because it allows me to work bigger and more spontaneously. I also appreciate the tactile nature of fabric and flexibility. I am always learning new techniques and currently would like to learn more about printing on fabric and methods of transferring images to fabric. 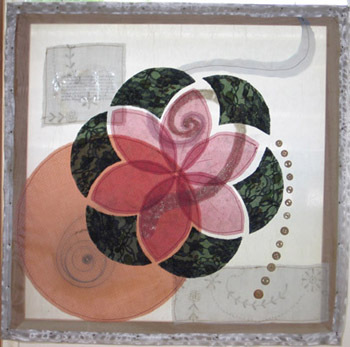 This medium seems to combine sculpture, my abstract designs, and my love of collage with existing imagery. Joy motivates me to continue making art. When I am immersed in a creative project my heart is happy. I know that sounds corny but it will have to suffice. Writer is not one of my many part-time careers."